Start off your visit on the 1st (Wed): take in the exciting artwork at Minima Gallery. To see where to stay, photos, maps, and other tourist information, read Mykonos Town online tour itinerary planner . Cairo, Egypt to Mykonos Town is an approximately 6.5-hour flight. You can also do a combination of bus, taxi, and flight; or do a combination of flight, taxi, and ferry. 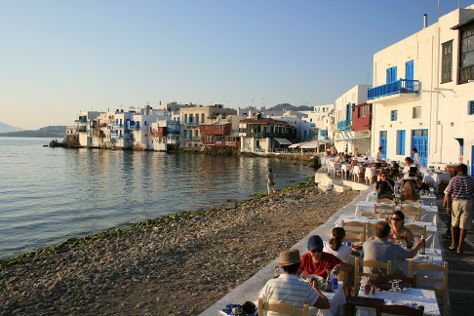 Traveling from Cairo in May, things will get little chillier in Mykonos Town: highs are around 26°C and lows about 20°C. Cap off your sightseeing on the 2nd (Thu) early enough to travel to Delphi. On the 3rd (Fri), contemplate in the serene atmosphere at Tholos, steep yourself in history at Temple of Apollo, then get engrossed in the history at Delphi Archaeological Museum, and finally delve into the distant past at Delphi. For more things to do, where to stay, reviews, and more tourist information, read our Delphi travel route planner . You can do a combination of ferry and car from Mykonos Town to Delphi in 5 hours. Alternatively, you can do a combination of flight and bus; or do a combination of ferry, bus, train, and taxi. Traveling from Mykonos Town in May, you can expect nighttime temperatures to be little chillier in Delphi, with lows of 15°C. Finish up your sightseeing early on the 3rd (Fri) so you can go by car to Athens. Athens is known for historic sites, museums, nightlife, shopping, and fun & games. Your plan includes some of its best attractions: explore the ancient world of Acropolis of Athens, explore the world behind art at Benaki Museum, take an in-depth tour of Acropolis Museum, and explore and take pictures at Panathenaic Stadium. To find more things to do, other places to visit, ratings, and more tourist information, refer to the Athens online tour planner . Getting from Delphi to Athens by car takes about 2.5 hours. Other options: do a combination of taxi and train; or take a bus. Traveling from Delphi in May, plan for a bit warmer nights in Athens, with lows around 20°C. Finish your sightseeing early on the 6th (Mon) to allow enough time to travel to Heraklion. 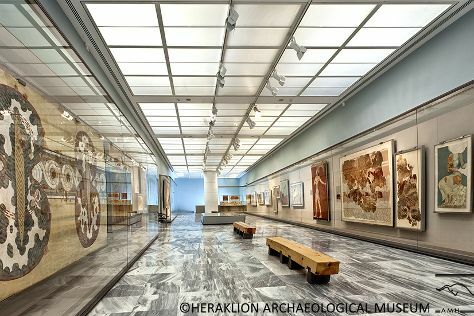 Start off your visit on the 7th (Tue): take an in-depth tour of Ιστορικό Μουσείο Κρήτης - Historical Museum of Crete, then get engrossed in the history at Heraklion Archaeological Museum, and then contemplate the long history of The Palace of Knossos. Plan a trip to Heraklion easily and quickly by telling Inspirock to suggest an itinerary. Traveling by combination of subway, flight, and bus from Athens to Heraklion takes 3 hours. Alternatively, you can do a combination of taxi and ferry; or ride a ferry. In May, daytime highs in Heraklion are 28°C, while nighttime lows are 18°C. Finish your sightseeing early on the 7th (Tue) to allow enough time to ride a ferry to Akrotiri. Kick off your visit on the 8th (Wed): tour the pleasant surroundings at Red Beach, then identify plant and animal life at Santo Horse Riding, then do a tasting at Boutari, J., & Son Wineries S.A., and finally delve into the distant past at Akrotiri. To find other places to visit, ratings, more things to do, and tourist information, go to the Akrotiri day trip planner. Traveling by ferry from Heraklion to Akrotiri takes 2 hours. In May, daytime highs in Akrotiri are 28°C, while nighttime lows are 20°C. Wrap up your sightseeing on the 8th (Wed) early enough to travel back home.